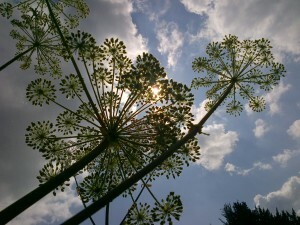 I just had to share this beautiful photograph of Angelica archangelica that I took recently. The structure of this plant never ceases to amaze and inspire me. Strong and sturdy, standing proudly 5 – 6 feet high, she dominates any garden and holds her own in the wild. I was inspired by a fellow herbalist to photograph her this way – showing her globes within globes against the blue sky. Today, I still use this herb in my clinic as it has many potent uses, mostly to support the body to throw off a chest infection and improve the appetite.